Co. Galway: Athenry (2), Ballynakill (4), Clonkeen, Craughwell, Dooniry (2), Kilchreest, Kilconeeran, Killeenadema, Killimer Daly, Kilmeen, Kilreekil, Kiltulla, Loughrea (4), Portumna (2), Teena. The population falling within the Union at the 1831 census had been 61,747 with divisions ranging in size from Killimer Daly (population 1,945) to Loughrea itself (14,210). 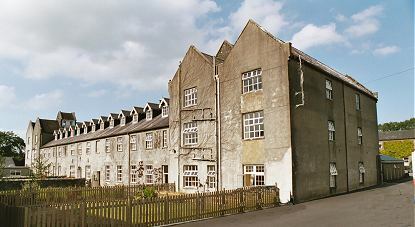 The new Loughrea Union workhouse was erected in 1840-1 on a 6.5-acre site half a mile to the south of Loughrea. Designed by the Poor Law Commissioners' architect George Wilkinson, the building was based on one of his standard plans to accommodate 800 inmates. Its construction cost £6,960 plus £1,740 for fittings etc. The workhouse was declared fit for the reception of paupers on 17th February 1842, and received its first admissions on 26th February. The site location and layout are shown on the 1892 map below. 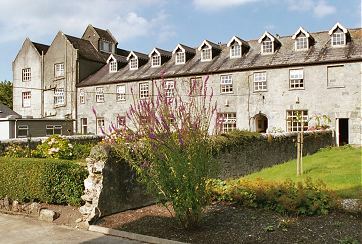 Loughrea entrance block from the south, 2003. 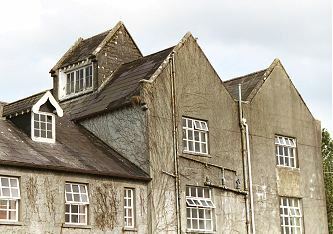 Loughrea main block from the south, 2003. A walled path ran between the entrance and main block. 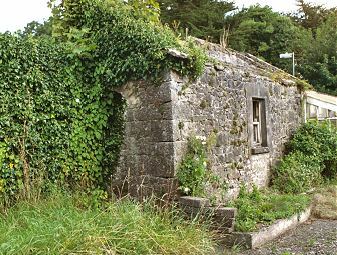 Loughrea walled path from the south, 2003. Ventilation towers in the roof of the main block were placed over the well-holes of internal staircases to improve the circulation of air through the building and also admit extra light. Loughrea oventilation tower from the west, 2003. Loughrea utility block and chapel from the east, 2003. 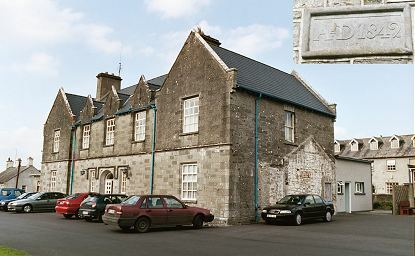 Loughrea infirmary block from the north-east, 2003. A small mortuary was located at the rear of the hospital block. Loughrea mortuary from the west, 2003. Each yard had a small privy (lavatory) for the inmates to use. 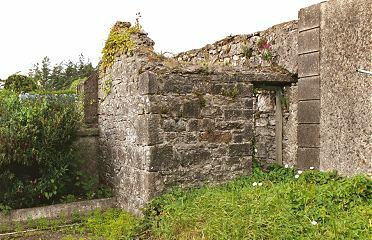 Loughrea privy from the east, 2003. 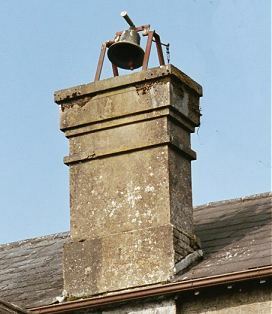 The inmates' daily life was regulated by the bell which hung high above the workhouse. 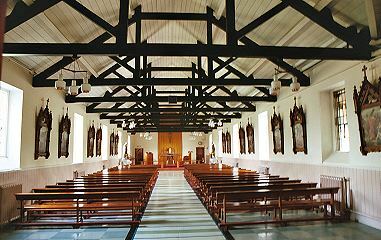 During the famine in the mid-1840s, sheds were erected to accommodate 100 fever patients. A fever hospital was subsequently erected at the south-east of the site with a graveyard nearby. In 1852, the south-eastern part of the Loughrea Union went to become part of the new Portumna Union. In 1895, Loughrea was visited by a "commission" from the British Medical Journal investigating conditions in Irish workhouse infirmaries. Their report listed a long catalogue of defects: the buildings and fittings were dirty and neglected, with the filthy lunatic wards being used to house ducks; in the entrance block, one of the rooms was being used as as bathroom, men's dormitory, male and female refectory, and waiting-room, the women sleeping above; as was typical elsewhere, no night nurse was employed. Further details are available in the full report. After 1923, the former workhouse was designated as a County Home. The water supply and sewerage system were improved, the kitchen and laundry remodelled, and a dining room and recreation rooms added. In the winter of 1924-5, the total number of inmates reached 520, and at the beginning of 1926 there were 162 lunatics in residence. From the 1950s, an input of trained nurses under the direction of the Sisters of Mercy assisted the hospital, now known as St Brendan's, develop a service specialising in providing care services for the elderly. The Sisters of Mercy continued to oversee nursing services at St Brendan's until 2001. Galway local archives, Island House, Cathedral Square, Galway. Holdings include Board of Guardians' minutes (1840-1905).